At the first consultation, we will listen what your symptoms are, and discuss the illness bothers you most. After the consultation, gathering all the information, and figure out the root of the problem, and planning for the further treatment. After the consultation, we chose the best combination of treatments for your symptoms. This treatment relieves pain; prevent disease, and promote good health. Patients are treated with the insertion of disposable ultra-fine needles into specific points of the body affiliated with internal organs and tissues. Acupuncture stimulates the nervous system and produces changes in the blood chemistry that facilitates the body’s ability to heal itself. The fine needle is inserted with minimal or no pain and has no possibility of infection. This is another type of acupuncture therapy, which stimulates the acupuncture-points and meridian channels of the body. The acupuncture needles are attached to an electric device that generates continuous electric pulses. The mild electrical current that passes through may have a light tapping sensation on the skin. It is an integrative therapeutic approach that combines movement with acupuncture. It is a highly effective treatment, used to increase range of motion in the spine, pelvis and other joints. 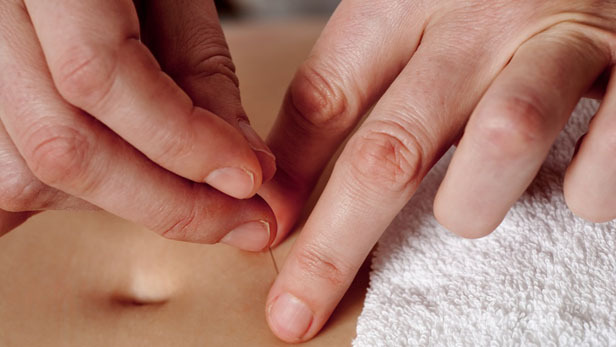 Kinetic acupuncture needling is performed at locomotors points throughout the body. While the needle is in place, the patient performs range of motion activities, or functional movements, which help to restore proper function to the muscles, tendons and ligaments in the injured areas. Unlike traditional acupuncture assessment, kinetic acupuncture is performed based on an evaluation of the kinetic chain. This involves range of motion and functional movement screens. Once these impaired movement patterns are identified, the treatment is designed to restore range of motion and optimum movement. The treatment is specific to a patient’s particular pattern of dysfunction. During kinetic acupuncture treatments, the patient does not lay still on a table for 15-30 minutes after the acupuncture needles are inserted. Rather, movement of the affected area is performed either by the patient or doctor. These movements or positions are performed to provoke, treat and rehabilitate the painful area. Movements are tailored for each individual’s specific dysfunction. Kinetic acupuncture can provide instant muscle relaxation and pain relief for both acute and chronic conditions. Corrective home exercises are prescribed that reinforce the treatment, speed up the recovery and reduce and eventually prevent the reoccurrence of the problem. While many people experience immediate relief, the response to treatment may vary depending on a person’s general state of health and the length of time they have had their condition.